The use of garlic dates back to ancient times -- it has been used for many purposes, including as a means to treat heart disease. Garlic is still used by many to lower blood pressure, but the preparation and amount affects its blood pressure-lowering potential. Although several studies show that garlic lowers blood pressure, the exact mechanism of how it does so warrants more study, according to researchers of a study published in Nutrition Research in 2014. Allicin is a highly unstable and reactive compound in garlic. It is an active ingredient associated with garlic's blood pressure-lowering effect, especially in those who have high blood pressure or hypertension. Researchers of a review study published in 2008 in BMC Cardiovascular Disorders concluded that the higher the starting blood pressure, the greater the reduction in the blood pressure after treatment with garlic. 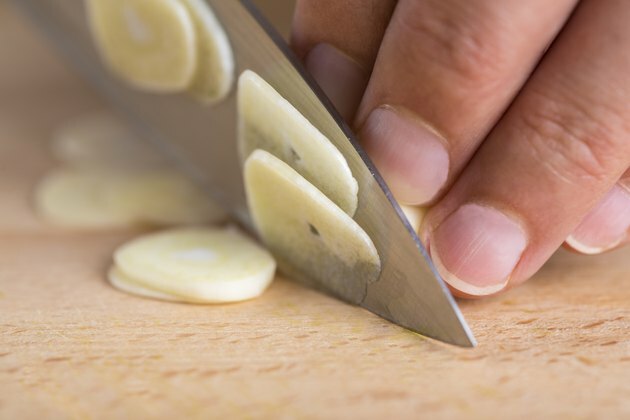 According to the Linus Pauling Institute, when you crush, chop or chew raw fresh garlic, an enzyme called alliinase is released, which starts a series of reactions resulting in the formation of allicin. Raw fresh or dried garlic may provide you with the most allicin. The allicin potential decreases with age or heat-treatment of the garlic. Researchers say that due to the instability of allicin, forms of garlic other than fresh raw or dried garlic, such as aged or cooked garlic, may have less allicin-forming potential. The instability of allicin is also the reason pure allicin is not available as a supplement. Researchers of a study published in 2013 in Pakistan Journal of Pharmaceutical Sciences divided individuals diagnosed with hypertension into groups, each with a different dosage of garlic -- 300, 600, 900, 1200 or 1500 milligrams of garlic per day -- or a placebo or blood pressure medication. They found that all the garlic dosages decreased blood pressure comparatively as much as the blood pressure medicine did, and that there was a greater reduction in blood pressure with the higher doses of garlic and with a longer duration of treatment. In the review in BMC Cardiovascular Disorders, the authors found that most of the studies that showed garlic's blood pressure-lowering effect used a dosage of 600 to 900 milligrams of garlic per day.